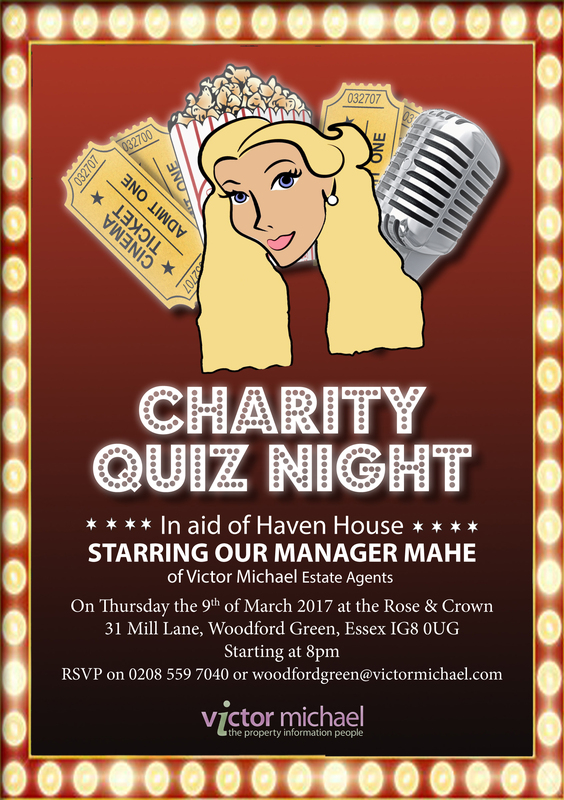 Come along for what promises to be a fun evening, with all money raised going to this worthy cause. Minimum six people per table, £5.00 per person, there will also be a raffle with some excellent prizes. Due to limited numbers, please let us know as soon as possible if you would like to be a part of this exciting evening. “The story of women’s struggle for equality belongs to no single feminist nor to any one organization but to the collective efforts of all who care about human rights,” says world-renowned feminist, journalist and social and political activist Gloria Steinem. Thus International Women’s Day is all about unity, celebration, reflection, advocacy and action – whatever that looks like globally at a local level. But one thing is for sure, International Women’s Day has been occurring for well over a century – and continue’s to grow from strength to strength. In 1910 a second International Conference of Working Women was held in Copenhagen. A woman named Clara Zetkin (Leader of the ‘Women’s Office’ for the Social Democratic Party in Germany) tabled the idea of an International Women’s Day. She proposed that every year in every country there should be a celebration on the same day – a Women’s Day – to press for their demands. The conference of over 100 women from 17 countries, representing unions, socialist parties, working women’s clubs – and including the first three women elected to the Finnish parliament – greeted Zetkin’s suggestion with unanimous approval and thus International Women’s Day was the result. Following the decision agreed at Copenhagen in 1911, International Women’s Day was honoured the first time in Austria, Denmark, Germany and Switzerland on 19 March. More than one million women and men attended IWD rallies campaigning for women’s rights to work, vote, be trained, to hold public office and end discrimination. However less than a week later on 25 March, the tragic ‘Triangle Fire’ in New York City took the lives of more than 140 working women, most of them Italian and Jewish immigrants. This disastrous event drew significant attention to working conditions and labour legislation in the United States that became a focus of subsequent International Women’s Day events. 1911 also saw women’s Bread and Roses‘ campaign. On the eve of World War I campaigning for peace, Russian women observed their first International Women’s Day on the last Sunday in February 1913. In 1913 following discussions, International Women’s Day was transferred to 8 March and this day has remained the global date for International Women’s Day ever since. In 1914 further women across Europe held rallies to campaign against the war and to express women’s solidarity. For example, in London in the United Kingdom there was a march from Bow to Trafalgar Square in support of women’s suffrage on 8 March 1914. Sylvia Pankhurst was arrested in front of Charing Cross station on her way to speak in Trafalgar Square. On the last Sunday of February, Russian women began a strike for “bread and peace” in response to the death of over 2 million Russian soldiers in World War 1. Opposed by political leaders, the women continued to strike until four days later the Czar was forced to abdicate and the provisional Government granted women the right to vote. The date the women’s strike commenced was Sunday 23 February on the Julian calendar then in use in Russia. This day on the Gregorian calendar in use elsewhere was 8 March. International Women’s Day was celebrated for the first time by the United Nations in 1975. Then in December 1977, the General Assembly adopted a resolution proclaiming a United Nations Day for Women’s Rights and International Peace to be observed on any day of the year by Member States, in accordance with their historical and national traditions. The UN commenced the adoption of an annual theme in 1996 – which was “Celebrating the past, Planning for the Future”. This theme was followed in 1997 with “Women at the Peace table”, and in 1998 with “Women and Human Rights”, and in 1999 with “World Free of Violence Against Women”, and so on each year until the current. More recent themes have included, for example, “Empower Rural Women, End Poverty & Hunger” and “A Promise is a Promise – Time for Action to End Violence Against Women”. By the new millennium, International Women’s Day activity around the world had stalled in many countries. The world had moved on and feminism wasn’t a popular topic. International Women’s Day needed re-ignition. There was urgent work to do – battles had not been won and gender parity had still not been achieved. The global internationalwomensday.com digital hub for everything IWD was launched to re-energize the day as an important platform to celebrate the successful achievements of women and to continue calls for accelerating gender parity. Each year the IWD website sees vast traffic and is used by millions of people and organizations all over the world to learn about and share IWD activity. The IWD website is made possible each year through support from corporations committed to driving gender parity. The website’s charity of choice for many years has been the World Association of Girl Guides and Girl Scouts (WAGGGS) whereby IWD fundraising is channelled. A more recent additional charity partnership is with global working women’s organization Catalyst Inc. The IWD website adopts an annual theme that is globally relevant for groups and organizations. This theme, one of many around the world, provides a framework and direction for annual IWD activity and takes into account the wider agenda of both celebration as well as a broad call to action for gender parity. Recent themes have included “Pledge for Parity”, “Make it happen”, “The Gender Agenda: Gaining Momentum” and “Connecting Girls, Inspiring Futures”. Themes for the global IWD website are collaboratively and consultatively identified each year and widely adopted. 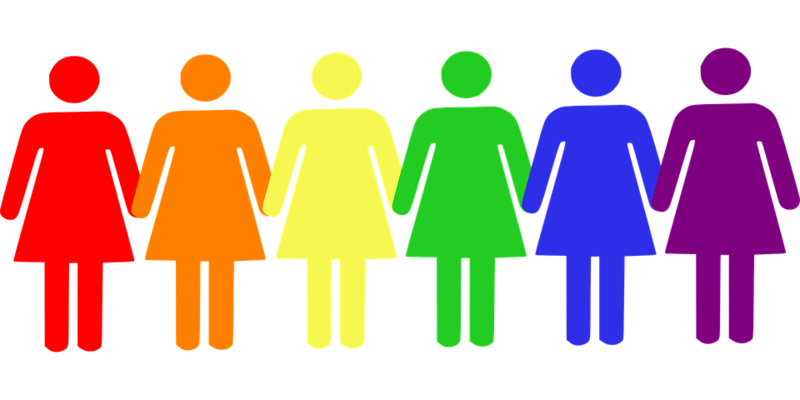 The world has witnessed a significant change and attitudinal shift in both women’s and society’s thoughts about women’s equality and emancipation. Many from a younger generation may feel that ‘all the battles have been won for women’ while many feminists from the 1970’s know only too well the longevity and ingrained complexity of patriarchy. With more women in the boardroom, greater equality in legislative rights, and an increased critical mass of women’s visibility as impressive role models in every aspect of life, one could think that women have gained true equality. The unfortunate fact is that women are still not paid equally to that of their male counterparts, women still are not present in equal numbers in business or politics, and globally women’s education, health and the violence against them is worse than that of men. However, great improvements have been made. We do have female astronauts and prime ministers, school girls are welcomed into university, women can work and have a family, women have real choices. And so each year the world inspires women and celebrates their achievements. IWD is an official holiday in many countries including Afghanistan, Armenia, Azerbaijan, Belarus, Burkina Faso, Cambodia, China (for women only), Cuba, Georgia, Guinea-Bissau, Eritrea, Kazakhstan, Kyrgyzstan, Laos, Madagascar (for women only), Moldova, Mongolia, Montenegro, Nepal (for women only), Russia, Tajikistan, Turkmenistan, Uganda, Ukraine, Uzbekistan, Vietnam and Zambia. The tradition sees men honouring their mothers, wives, girlfriends, colleagues, etc with flowers and small gifts. In some countries IWD has the equivalent status of Mother’s Day where children give small presents to their mothers and grandmothers. The Department for Business, Energy and Industrial Strategy has released guidance to landlords of privately rented non-domestic property on complying with the 2018 ‘minimum level of energy efficiency’ standard (EPC band E). 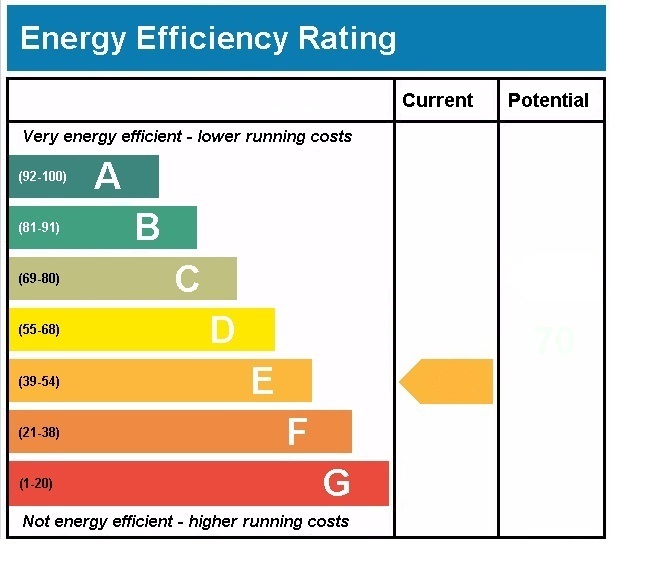 The Energy Efficiency (Private Rented Property)(England and Wales) Regulations 2015 mean that, from April 2018, private non-domestic (and domestic) landlords must ensure that properties they rent in England and Wales reach at least an EPC rating of E before granting a tenancy to new or existing tenants. The appeals framework: landlord appeals will be heard by the First-tier Tribunal, part of the court system administered by Her Majesty’s Courts and Tribunals Service; the guidance discusses the steps a landlord will need to take to lodge an appeal, and how that process will be run. People in the UK looking for a new mortgage now have even more choice with a number of lenders launching new rates and products. The TSB has reduced interest rates by 0.10% on selected mortgages for home movers, first time buyers and remortgage borrowers. These include five year fixed rates and two year fixed rates for remortgagers. ‘We want to help more people to borrow well and today’s rate cuts are good news for those with a higher deposit,’ said Roland McCormack, TSB mortgage distribution director. Accord Mortgages has launched a selection of competitive fixed rate mortgages for borrowers with a 35% deposit and there are added features such as cashback, free standard valuation or free legal fees. The intermediary only lender, which is part of Yorkshire Building Society, has also made rate reductions by up to 0.25%. These include a 2.99% five year fixed rate at 85% LTV which is available to both home buyers and remortgage customers and has no upfront product fee. ‘By refining our product range we have a greater ability to ensure our core mortgages remain competitive and appealing to borrowers. However, as always we will monitor the market and listen to brokers to ensure our product range continues to meet a variety of customer needs,’ said David Robinson, Accord national intermediary sales manager. The Chelsea Building Society has launched a variable rate two year tracker mortgage with no early repayment charges (ERC) with an interest rate of 1.15%, the lowest variable tracker mortgage rate currently on the market, and it is available to both home buyers and those looking to remortgage with a 35% deposit. It comes with a £995 product fee. The new mortgage, which tracks the Bank of England base rate, is designed to provide homeowners with flexibility to exit their mortgage early without paying an ERC should their circumstances change over the next two years. ‘Our new tracker doesn’t tie borrowers into their mortgage, giving them breathing space to review their options on a regular basis with the bonus of not being subject to early repayment charges. As it is the lowest variable rate tracker mortgage currently available on the market it will appeal to customers who are keeping an eye on interest rates,’ said Richard Barker, mortgage product manager at the Chelsea Building Society. ‘The market continues to benefit from buoyant demand for Buy to Let remortgage as landlords take action to minimise costs and manage profitability. This market has become even more active since the changes to stamp duty came into effect last March and ahead of the impending changes to tax relief,’ said Jaedon Green, Leeds Building Society’s director of product and distribution. Leeds Building Society introduced new criteria on 01 January following changes to underwriting standards for buy to let by the Prudential Regulation Authority (PRA). 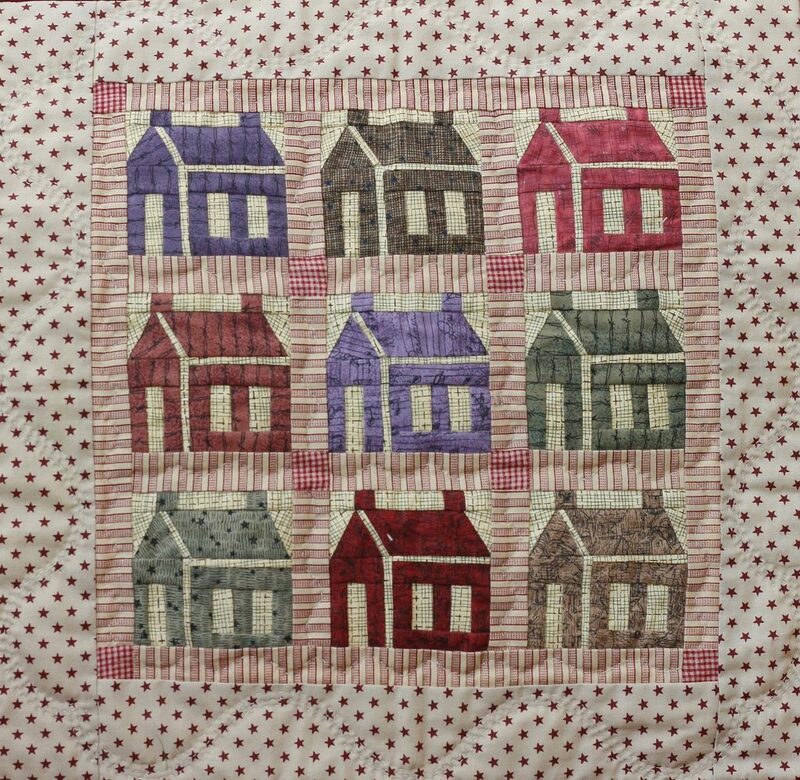 New criteria includes an income covering ratio (ICR) of 140%, reducing the stress test rate for remortgages with no additional borrowing to 5%, and removing the minimum income requirement. Our team at Victor Michael are always delighted to answer any of your questions on preparing to bring a property to market successfully. Should you still be investing in Stratford Buy To Let? If I were a buy to let landlord in Stratford today, I might feel a little bruised by the assault made on my wallet after being (and will continue to be) ransacked over the last 12 months by HM Treasury’s tax changes to buy to let. To add insult to insult to injury, Brexit has caused a tempering of the Stratford property market with property prices not increasing by the levels we have seen in the last few years. I think we might even see a very slight drop in property prices this year, and if Stratford property prices do drop, the downside to that is first time buyers could be attracted back into the Stratford property market, meaning less demand for renting (meaning rents will go down). Yet, before we all run for the hills, all these things could be serendipitous to every Stratford landlord, almost a blessing in disguise. Yields will rise if Stratford property prices fall, which will also make it easier to obtain a buy to let mortgage, as the income would cover more of the interest cost. If property values were to level off or come down that could help Stratford landlords add to their portfolio. Rental demand in Stratford is expected to stay solid and may even see an improvement if uncertainty is protracted. 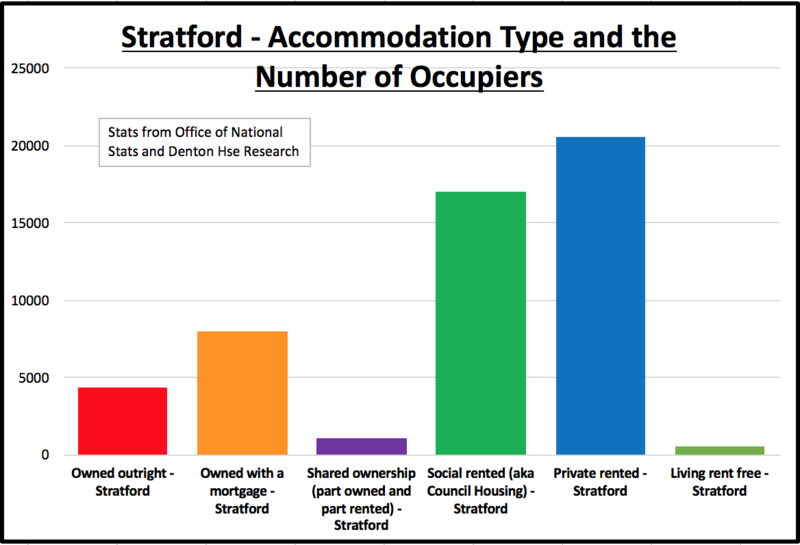 However, there is something even more important that Stratford landlords should be aware of, the change in the anthropological nature of these 20 something potential Stratford first time buyers. I have just come back from a visit to my wife’s relations after a family get together. I got chatting with my wife’s nephew and his partner. Both are in their mid/late twenties, both have decent jobs in Stratford and they rent. Yet, here was the bombshell, they were planning to rent for the foreseeable future with no plans to even save for a deposit, let alone buy a property. I enquired why they weren’t planning to buy? The answers surprised me as a 40 something, and it will you. Firstly, they dont want to put cash into property, they would rather spend it on living and socialising by going on nice holidays and buying the latest tech and gadgets. They wanted flexibility to live where they choose and finally, they didn’t like the idea of paying for repairs. All their friend’s feel the same. I was quite taken aback, because buying a house is just not top of the list for these youngsters. 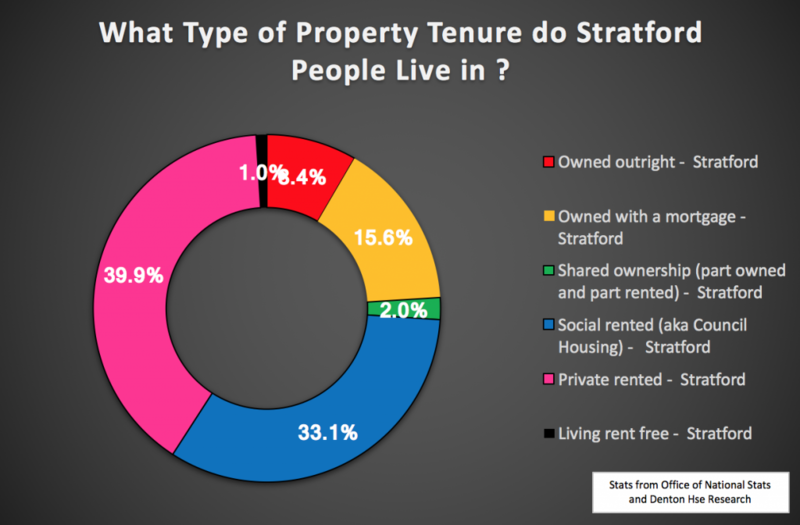 So, as 39.9% of Stratford people are in the rented accommodation and as that figure is set to grow over the next decade, now might just be a good time to buy property in Stratford – because what else are you going to invest in? Give your money to the stock market run by sharp suited city whiz kids – because at least with property – it’s something you can touch- there is nothing like bricks and mortar! Growing up to an inch a day, Knotweed has the ability to mature rapidly across a large surface area, with the slightest trace causing continuing problems. Japanese Knotweed (or Fallopia Japonica) is a large, invasive plant species which finds its way into the fabric of a building, e.g. joints in concrete, cavity walls, weaknesses in broken mortar between paving slabs or bricks, and in severe circumstances, can cause major structural damage to properties. In a landmark legal case, Network Rail is now facing compensation claims after they ignored pleas by residents to remove the Japanese Knotweed growing on its land after it encroached on to their homes. Neighbours Robin Waistell and Stephen Williams saw the value of their homes halved after the weed spread into the foundations which resulted in Mr Waistell unable to sell his house. It is virtually impossible to secure finance on land or property with Japanese Knotweed on or adjacent to it as UK banks and lending institutions will not give mortgages on properties affected by knotweed. After a four-day hearing at Cardiff County Court, the rail giant was ordered to pay £4,320 to each of the men to treat the knotweed and £10,000 each in compensation for the fall in value of their homes. The judge added that if the knotweed was not treated, they could also claim for the full drop in value, a substantial £66,000. So, what advice can you give to your customers on how best to spot and tackle Japanese Knotweed? Knotweed is often identified during site surveys. Whilst it may look small and contained, do not underestimate the scale of the potential problem; the plant can grow up to nine feet in height and roots up to three metres deep. It is important to have the plant treated as soon as possible to avoid further growth and prevent the property sale from falling through. Financially, eradication of Japanese Knotweed can become costly if left untreated. Kitchen is king when it comes to influencing potential buyers. What influences you the most? The latest survey from home services marketplace, has revealed that a new kitchen is the most effective home improvement for influencing a potential buyer’s final decision as well as their offer. According to the data, when looking to buy a new property, 47% of potential homeowners would be influenced by it having a recently fitted kitchen. 28% would also be more likely to offer a higher price for this feature. Having a new bathroom also has a strong influence on home buyers; 46% would consider this when deciding whether to buy and 27% would potentially be willing to offer more money. The order of rankings then somewhat divides. Looking at home improvements affecting the final decision to buy, new windows (45%) ranks third, followed by a new boiler (43%), a new extension (34%) and new loft insulation (33%). At the other end of the table, 31% of home buyers claimed that a new conservatory would affect their decision to buy. New garden landscaping (29%) follows this and new lighting (23%) sits at the bottom of the table. It’s interesting when this order is compared to how home improvements affect the buyer’s decision to offer a higher price. New extensions climbs the rankings to take 3rd with 26%, whilst a new conservatory is also ranked highly with 23% of home buyers feeling this warrants a higher price. Extensions to the property clearly have a stronger influence on the offer than the decision to buy for potential buyers. It’s quick and simple! Get your free instant valuation in minutes with no appointment, no day off work and no time wasted! Our online valuations are estimated based on information available via the public Land Registry data and should therefore be used as guidance only. This valuation does not take into consideration the current condition of the property or any improvements made since its last sale. Valuations for properties that were last sold before January 1995 will have an estimation based on neighboring sales. 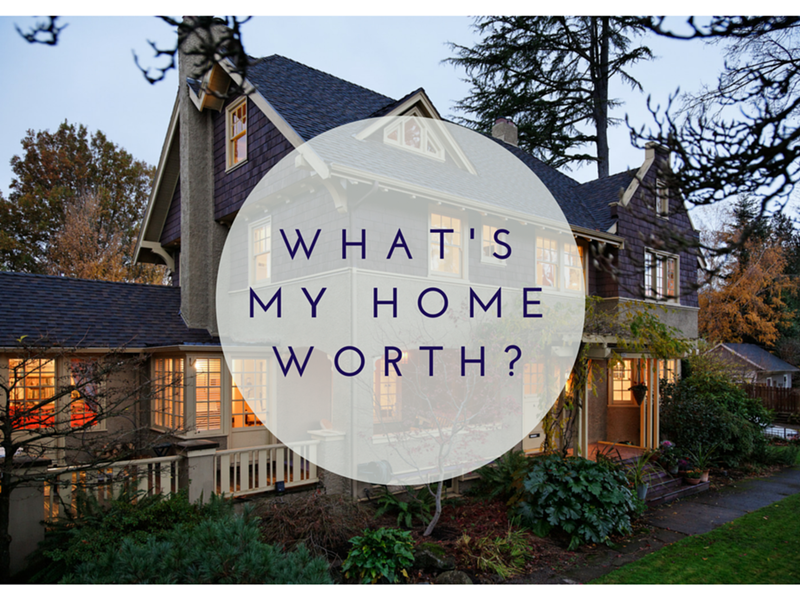 Click here for your free instant valuation! Kicking off 2017, we’ve predicted stabilisation in the property market with sustainable growth and high demand. 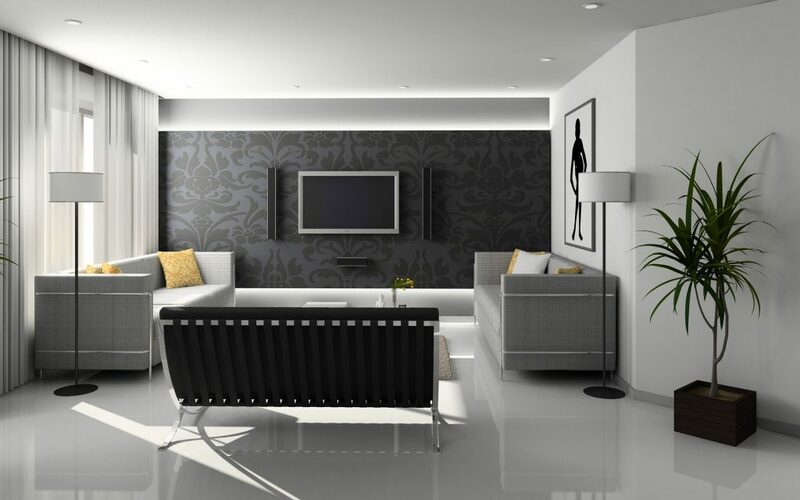 Whether you’re looking to take advantage of the abundance of hungry buyers by putting your property on the market, or simply want to make your house feel more like a home; we’ve put together a series of interior design blogs, full of tips and trends to help you show your property in its best light. New year, new beginnings, and a welcome return of green to the interior palette. Traditionally associated with hope and optimism, the trend for integrating green surface finishes or foliage within our homes will come as a much sought after distinction to fast-paced urban lifestyles. In contrast to the original toxic manufacture of green, blending arsenic and Verdigris, we now associate green with calmness and well being. Letting the outside in has become increasingly popular within our workspaces and architecture, highlighted by a surge in the use of feature living walls and hanging plants. Progressive and versatile, greens can be combined with a plethora of on-trend shades, such as blush pink or warm ochre tones to achieve an infinite array of styles. It can be used to add warmth and disparity to man-made finishes such as concrete or metal, while still complementing natural materials such as marble, raw timbers and leather. For something small, adding a splash of green to any monochromatic interior will add an allure of contemporary, refreshing vibrance to a traditional palette. An air of opulence and luxury can be attained in any design with the simple addition of a deep green velvet sofa or chair. For the brave, embracing the resurgence of colour and pattern in our homes, green can be paired with jewel tones for a rich and lavish complex colour palette to stimulate creativity. However small, the addition of green is sure to revitalize your home for 2017.